Wednesday nights are to help you connect to God and to one another. 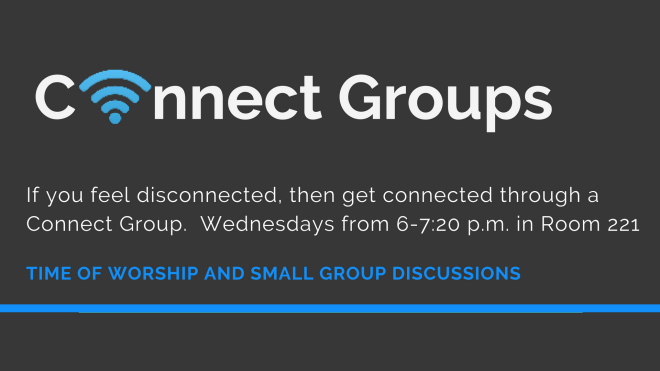 If you are not connected to serving in AWANA, then be a part of a Connect Group from 6-7:20 p.m. Connect Groups will meet in Room 221 with a time of worship and small group discussions based around the previous Sunday sermon and what is happening in your life. Your group will stay consistent so you can develop deeper relationships with a small group of people, as you deepen your relationship to God. If you feel disconnected, then get connected through a Connect Group.